I prefer all my drinks room-temperature or warm (including water), probably because I’m Vata according to Ayurveda and almost always feeling cold rather than warm. 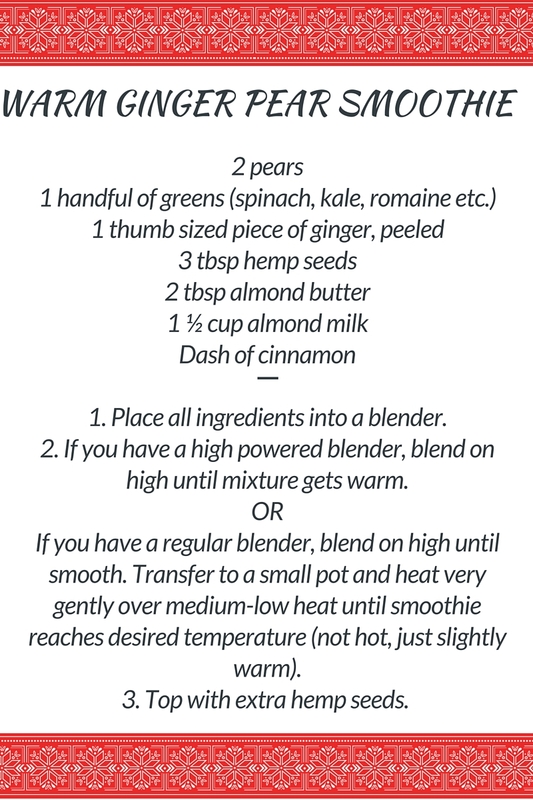 I use lots of warming spices like cinnamon, cayenne, cardamon and turmeric (when cooking, in smoothies, as well as with my morning tea), but never thought to slightly warm up my smoothie before. You can also warm it up a little in your high-speed blender if you let it run a little longer and the motor of the machine starts warming it up. This recipe for Warm Ginger Pear Smoothie is great for breakfast or snack during the colder season. Great minds think alike! 🙂 Taalla on melko kylma tahan aikaan vuodesta (Kalifornian mittakaavassa) ja ma heraan aina aamuisin jaatavaan asuntoon ja viimeinen asia jota tekee mieli on kylma smoothie. Mukavaa uuden viikon alkua!